I listen to Family Life radio and they talk about this all the time. With the Lord we have his intention, purpose for our lives. We pray every day for his will for us. We become who we should be, caring about others and seeing what we can do to help. We pray for all. We have peace in His Word and find joy in our days. We may stumble in his purpose at times but, that is not because of him. It is the sin abundant in this world. We are not of this world. We belong to the Church of Christ, not a building. We are teachers, disciples, cross bearers of his truth. It is trials, that make us stronger and it is our flesh that fights against the Holy Spirit in us. We cannot shed that part of ourselves until He comes again. We do wait and are ready because we see this world falling apart. So many ways this is occurring and people love to explain it away. Earthquakes, severe flooding, storms, fires, morals are deteriorating more and more. Not to mention the whole Middle East is warring. Killing their own and threatening to kill all Israelis, God’s chosen people. Jesus, his lineage is traced back to the tribe of Judah from where the High priest will come to take vengeance and reestablish his people with new hearts. Jesus went willingly to the cross for all that would believe in Him to bring salvation to the world. He knows all our hearts and minds. He will be our High Priest forever. Living an intentional life is all of the above. You strive to enter the narrow gate. You pray, read your Bible daily, trust in God for answers and guidance through His Word and the (indwelling) Holy Spirit. If you have not you do not know Jesus. 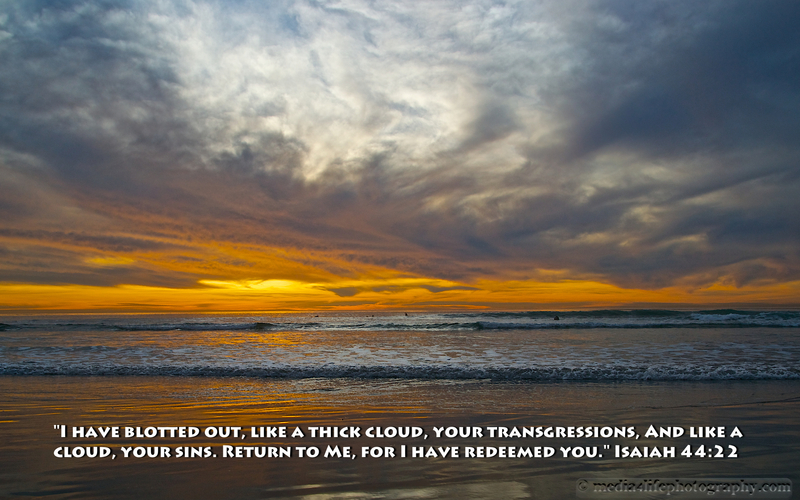 “I have blotted out, like a thick cloud, your transgressions, And like a cloud, your sins. Return to Me, for I have redeemed you.” Isaiah 44:22. Another one of God’s great promises in the Bible. There are over 7000 promises in the word of God. To be honest, I don’t know them all, but one thing I know for sure, God keeps His promises. Our sins are blotted out and God does not remember them anymore. That is something that we as believers need to lay hold off. As far as the east is from the west, so far has He removed our transgressions from us.” Psalm 103:12. There are way too many believers living a life of condemnation, believing that they are not good enough or are failing God everyday. I have good news for those who believe that, we as believers will never be good enough or perfect before God. We will always fall short of His glory, no matter how hard we may try to please Him. It is not about us or what we do or have done. It is all about Jesus and what He has done on Calvary. He was the only one that lived a perfect life and He was the only one that did the will of His Father. “And He who sent Me is with Me. The Father has not left Me alone, for I always do those things that please Him.” John 8:29. That is impossible for fallen man, believers or non-believers alike. We can never live a perfect life and please God. In the eyes of God no one is righteous. “But we are all like an unclean thing, and all our righteousnesses are like filthy rags; we all fade as a leaf, and our iniquities, like the wind, have taken us away.” Isaiah 64:6. Jesus did it all for us, by laying down His life as a propitiation before God. He was the unblemished passover lamb. His blood cleanses us from all sin. It is not our righteousness, but His righteousness that was imputed onto all of those who believe in Him by faith. Once we realize, that Jesus has done it all for us by going to the cross, there should be no feeling of condemnation or an inch of doubt that God loves us. He loves us so much, that He gave His only begotten Son. Jesus is our reconciliation and He is our High Priest. Jesus has torn the curtain to the Holy of Holies and we as believers have direct access through Him and come boldly before the throne of God. God looks at the believers through the blood of Christ, He has redeemed us by His precious blood. The blood that does not just cover our sins as it was the case with the sacrificial animals, but His blood takes away the sins once and for all. We will always fall short and those who believe that the are sinless are plain and simply, self-righteous people, condemning others, believing that they are better than others. The Bible teaches just the opposite, self-righteousness will not justify anybody before God. It is God’s grace and the finished work of Jesus on the cross that justifies the believers. We are saved by grace through faith and even the faith of the believers was given to them by God. The next time you have any doubts or feel like God does not love you, look at the cross. At the cross, God demonstrated His love for us. Stop worrying and let God do the good work in you and through you. Surrender to His will. Let His will be done, not yours. Jesus is the author and finisher of our faith. He started it and He will finish it. And that, is also a promise. “…being confident of this very thing, that He who has begun a good work in you will complete it until the day of Jesus Christ;…” Philippians 1:6. “There is therefore now no condemnation to those who are in Christ Jesus, who do not walk according to the flesh, but according to the Spirit.” Romans 8:1. “For God so loved the world that He gave His only begotten Son, that whoever believes in Him should not perish but have everlasting life.” John 3:16. “As far as the east is from the west, so far has He removed our transgressions from us.” Psalm 103:12. But when the young ruler heard that saying, he went away sorrowful, for he had great possessions. Then Jesus said to His disciples, “Assuredly, I say to you that it is hard for a rich man to enter the kingdom of heaven. So Jesus said to them, “Assuredly I say to you, that in the regeneration, when the Son of Man sits on the throne of His glory, you who have followed Me will also sit on twelve thrones, judging the twelve tribes of Israel. And everyone who has left houses or brothers, or sisters, or father or mother or wife or children or lands, for My name’s sake, shall receive a hundredfold, and inherit eternal life, But many who are first will be last, and the last first. In telling the ruler to go sell everything, Jesus was exposing the young man’s true heart. His refusal to obey two things: 1)he was not blameless as far as the law was concerned, because he was guilty of loving himself and his possessions more than his neighbors and 2)he lacked true faith, which involves a willingness to surrender all at Christ’s bidding. Jesus was demanding that this young man give Him first place. The young man failed the test come, follow Me. It was a call to faith. It is likely the young man never heard or contemplated it, though, because his own love of his possessions was such a stumbling block that he had already rejected Jesus’ claim to lordship over his life..Thus he walked away in unbelief. Camel…eye of a needle. It is impossible. Jesus was underscoring the impossibility of anyone’s being saved by merit. Since wealth was deemed proof of God’s approval, and those who had it could give more alms, it was commonly thought that rich people were the most likely candidates for heaven. Jesus destroyed that notion, and along with it the notion that anyone can merit enough divine favor to gain entrance into heaven. Who can be saved? Salvation is possible only by divine grace. To Nicole in case you should read this. I know dad says you are really busy. I just want you to know I pray everyday for all of you. I wish you success in your schooling. I know you are very dedicated and are doing well. I miss you everyday of my life. I am so sorry I had to get sick. I don’t know why it happened. I can only live in the now. The past cannot be changed. I have been busy giving God my all. I really would love to just be full-time in God’s work. We all need a little money though. So I am again searching for that part-time job. Whoa, but it so cold here today about eight degrees and no break in sight. At least my car seems to be okay (Praise the Lord). It had an oil leak after it got a used engine. Anyway I love you for always, I miss you for always and for always my daughter you will be. P.S. 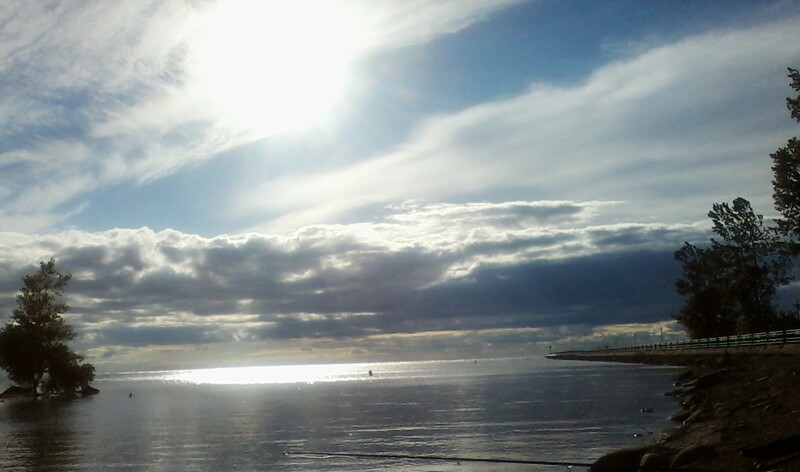 Yesterday was so beautiful. Our church has Bible classes for kids in elementary schools once a month. Also they go four times monthly to two other schools. Then we have our teens and young children regular members classes. It was the first time I volunteered. Our members are being more committed to becoming more active in church activities and the lives of our members… let me tell you this was just so joyful. Even today I cannot stop smiling about the experience. These kids love the Lord and are learning the Bible. Blessed is this day and everyday with the Lord. I had gotten a car and then the engine went. I trusted the Lord and had a used engine put in. With a few setbacks, I pray it will be okay now. This week has been spent mostly at home studying the Bible and listening to sermons. I could have used mom’s car and gone out but, I do believe it was very precious time spent with the Lord. I do work for the Lord in every way I can, every day I can. I believe this trial did work out to His Purpose. I need to get back working part-time also. I do have a couple of options at the moment. He gives us all we need and he promises never more than we can handle. Here are some Bible verses that tell of the Lord’s ascension into heaven after his resurrection from the dead and appearing to his apostles for forty days. After he ascended they received the Holy Spirit (the helper) which we receive also if we believe the truth. There is no other way to heaven except to truly believe that Jesus died for sinners. We cannot of ourselves do anything to earn our way. We must repent of our sins and believe he is the only way truly in our hearts. You must fear God and his wrath upon this earth when he returns. We must be faithful and wise servants, always waiting and watching. Reposted from Why Not Believe?